Now available on Amazon ! Posted: October 31, 2017 | Author: daveribble | Filed under: Uncategorized | Comments Off on Now available on Amazon ! The Way of The Conscientious Connection came about because I had to come to grips with the fact that what I thought was intelligent networking was actually little more than simply chasing after the very small number of people in a room I deemed to be my so-called ‘target market’ while dismissing the other 98% as not being worthy of my time. It took the greatest economic downturn since the Great Depression to get my attention and force me to finally come to grips with the fact that all I was doing, all that everyone seemed to be doing was nothing much more than just ‘showing up’, collecting a few business cards and promising myself I would follow up in a few days. If that rings any bells for you, welcome to the club. 2008 taught me how much more valuable and important it is to develop resources, connections, contacts, referral partners and others who, first and foremost, just want to help you be as successful as you want to be. They are sometimes people who will buy from you, but most of the time they are not, yet they can cause tremendous benefit if you step up and help them, as well. Moreover, however, the right people to continually add to your database should be people who can instrumentally help you find the people you need to meet to further your career, enhance your presence, help you develop better skills and be more than happy to recommend you to others. Note: I didn’t say they have to be your customers, either. What amazing things can happen if we all get on board with this? Imagine a company with just a few salespeople, but because the whole company received my training, the owner can effectively scale their sales force without adding even one more person to the payroll. Or, imagine you are a student and you have been taught these skills before you graduate. When I have interviewed professors, I have asked them two questions: “How important would you say it is, how valuable, that your students have good connecting skills before they leave here and go out into the world to seek their fame and fortune?” And, professors have admitted to me that in many instances, this skill set is more valuable to the potential success for a student than the diploma they worked four + years to earn! My second question, then, is this: “Would you please show me in your course curriculum where you have devoted just one semester of higher learning to this most important skill set?” And, of course, I have yet to find one college or university anywhere that provides this needed information. The book and stories will undoubtedly bring you a fresh look at how well, or not, we tend to connect with each other and the subsequent value or pain that comes from those activities. 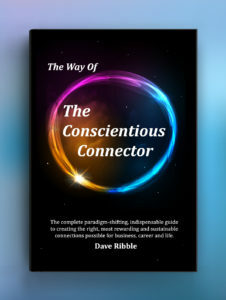 If you are trying to move your business or career or life in a new direction and a better outcome, consider making a study of The Way of The Conscientious Connector. One simple paradigm shift like this can cause untold numbers of people to have a happier, healthier and more successful life. Are there others in your world who could use this information, too?